The Death of Superman Lives What Happened? Back in the ‘90s, Nicolas Cage was going to play Superman for Tim Burton. The film got canceled, however, and quickly became an Internet urban legend. Well now, a documentary on that film has revealed that Cage’s Superman actually would have looked shockingly great. That’s the photo above, courtesy of director Jon Schnepp. He directed the documentary The Death of Superman Lives: What Happened?, which we wrote about in detail here. 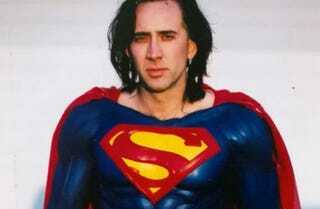 The basic idea is Tim Burton was going to direct Nicolas Cage in a film called Superman Lives. It never ended up happening though and a few terrible images leaked out in the years following, cementing the world’s insistence canceling the film was a good thing. But in the documentary, which is on-demand and Blu-ray now, Schnepp reveals images like the one above, which prove Burton wasn’t crazy. He knew what he was doing and those leaked images were taken out of context and from the very early stages of pre-production. If the movie got made, Cage would’ve looked like he does in that photo, not this one, which you’ve seen all over the Internet. Read more about the documentary in our story or head to the official site.